3117, CENTER CAP USED, 95-98, FORD, CONTOUR, MACHINED FINISH, ETCHED FORD LOGO, 4 METAL CLIPS, 5-3/4" DIA. 3194, CENTER CAP COPY, 97-00 FORD, F150, CHROME, 5 STAR SHAPED, ROUND INDENTED CIRCLE ON OUTER EDGE, NO LOGO, 4 METAL LUG NUT CLIPS, 7-7/8" DIA. 473a, Hubcap CENTER CAP USED, 90-94 CHRYSLER, LEBARON, NEW YORKER, SILVER BACKGROUND, CHROME WORD CHRYSLER, CHROME RING ON OUTER EDGE, 5-5/8" DIA. 473e, HUBCAP CENTER USED, 90-94 IMPERIAL, BLACK BACKGROUND, GOLD WORD IMPERIAL, GOLD RING ON OUTER EDGE, 4 METAL CLIPS, 5-5/8" DIA. 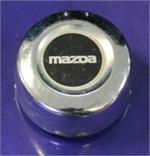 58682, CENTER CAP USED , 92-94, AUDI, 100, METAL CAP, SPARKLE SILVER, ENGRAVED LOGO, 4 METAL CLIPS, 2-1/2 DIA. 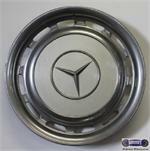 58726, CENTER CAP USED, '00-'06, AUDI, TT, CHROME, ENGRAVED LOGO, 4 METAL CLIPS, 2-1/4" DIA. 70156, CENTER CAP USED, '85-'86, VOLVO, MACHINED, BLACK CENTER, CHROME LOGO, CHROME WORD VOLVO, 4 METAL CLIPS IN CENTER OF BACK, 9-3/4" DIA. 70165, CENTER CAP USED, 15", 87-90, Volvo, 780, CHROME WITH BLACK CENTER & CHROME LOGO AND VOLVO IN CENTER, 4 METAL CLIPS IN CENTER.6" DIA. 15 SPOKE ALUM. 829b, Hubcap CENTER USED, 83-86, MERCURY, MARQUIS, BLACK PLASTIC CAP, BLACK BACKGROUND, CHROME LOGO, 4 METAL CLIPS, 3-3/4" DIA. 832b, Hubcap CENTER USED, 83-89, LINCOLN, TOWN CAR, MARK SERIES, CHROME OUTER EDGE, BLACK BACKGROUND, CHROME LOGO, 4 METAL CLIPS, 4-3/8" DIA. 832c, Hubcap CENTER USED, 15", 83-89, LINCOLN, TOWN CAR, MARK SERIES, CHROME OUTER EDGE, BLACK BACKGROUND, GOLD LOGO, 4 METAL CLIPS, 4-3/8" DIA. 871, Hubcap CENTER USED, 88-89, MERCURY, TOPAZ, BLACK, BACKGROUND, CHROME LOGO, 2 METAL CLIPS, STRAIGHT BAR CLIP. 3-3/4" DIA.